Native Americans and environmental activists voiced their alarm over President Donald Trump’s decision to advance work on the Keystone XL and Dakota Access pipelines. Both projects were reluctantly halted by the Obama administration after many protests. Keystone XL was intended to speed up the flow of oil from Canada’s Alberta tar sands to US refineries, but in November 2015 President Barack Obama declined to approve it, calling it politically controversial. The Dakota Access Pipeline (DAPL), intended to carry crude oil from the Bakken shale fields to Illinois, has been nearly completed aside from a segment running under Lake Oahe, which supplies drinking water to the Standing Rock Sioux Tribe in North Dakota. Demonstrators gathered outside the White House on Tuesday afternoon. Into the evening, protesters also spoke out in Los Angeles, Seattle and New York City. In downtown Seattle, around 1,000 protesters attended "an emergency rally" Tuesday night, according to KIRO. Many also targeted a local Wells Fargo, for the big bank's financial role in the construction of the Dakota Access Pipeline. Many more took over the traffic intersection of Columbus Circle in Manhattan. Dozens came out to Westwood in Los Angeles, chanting outside the Federal Building. 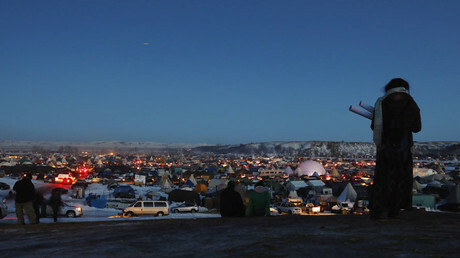 Months of protests from Native Americans, environmentalists and even military veterans pressured the Obama administration to order a halt to DAPL construction in December 2016. On Tuesday, however, newly inaugurated President Trump signed a presidential memorandum calling for the construction to resume, pending certain qualifications. 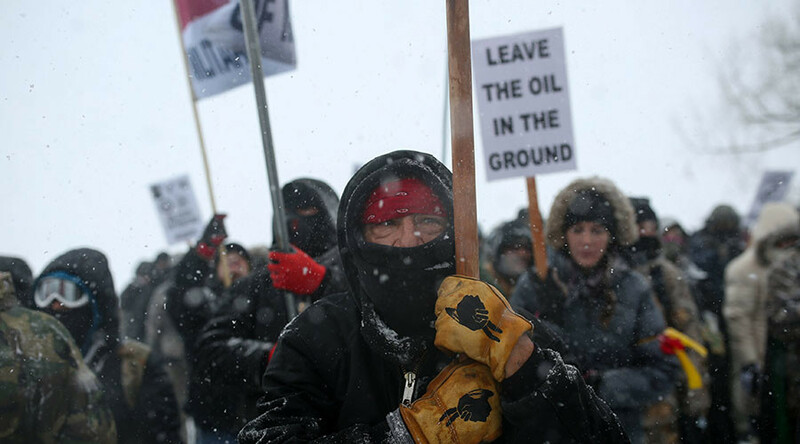 Archambault warned that the existing pipeline route not only infringes on the tribe’s treaty rights, but any spills from DAPL risk contaminating the water used by both the tribe and some 17 million Americans living downstream. “Creating a second Flint does not make America great again,” Archambault added. “We will be taking legal action, and will take this fight head on. We urge you to fight and stand tall besides us,” the tribe said on its Facebook page, asking for support to influence the environmental impact statement on the Lake Oahe segment. “Please also call your congressional representatives and let them know that the people do not stand behind today's decision. Stand together as one and we will not fall,” the post said. “These attacks will not be ignored, our resistance is stronger now than ever before and we are prepared to push back at any reckless decision made by this administration,” Goldtooth said. News that Keystone XL was back on the table was met with concern by Nebraska activists who had successfully campaigned against it. 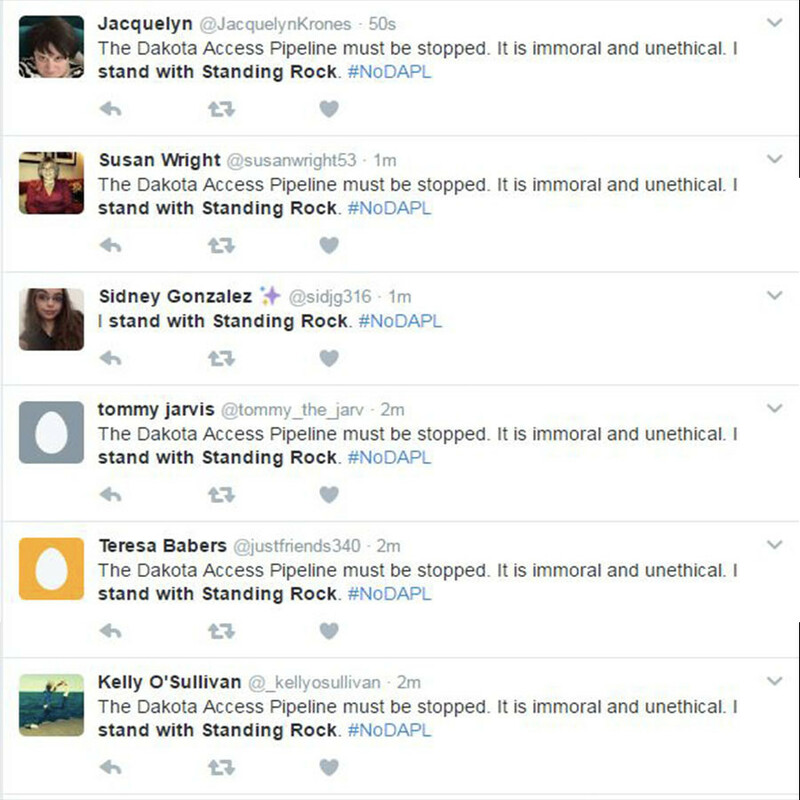 Multiple Twitter users posted this identical message on January 24, 2017, after US President Donald Trump ordered work on Dakota Access Pipeline to proceed.